This page provides you with Postdoctoral Fellow resume samples that you can use for inspiration in writing your own resume, or for creating one through our easy-to-use resume builder. Below you'll find our how-to section that will guide you through each section of a Postdoctoral fellow resume. As a postdoctoral fellow, you are well aware that resumes are a crucial stage of the recruiting process: they must be perfect. You are looking for a new position and you want that resume that not only is up to par, but can also make the real difference when it comes down to you and other candidates. You might feel lost when it comes down to creating the best resume to get you the job you have always dreamt of, but do not worry! With the best postdoctoral resume sample in the market, we have inspired quite a few colleagues of you in the past and we want to do the same for you: your resume will look fantastic and recruiter will take notice of you, we promise. We are exactly what you are looking for, let us help you create an outstanding resume right now! 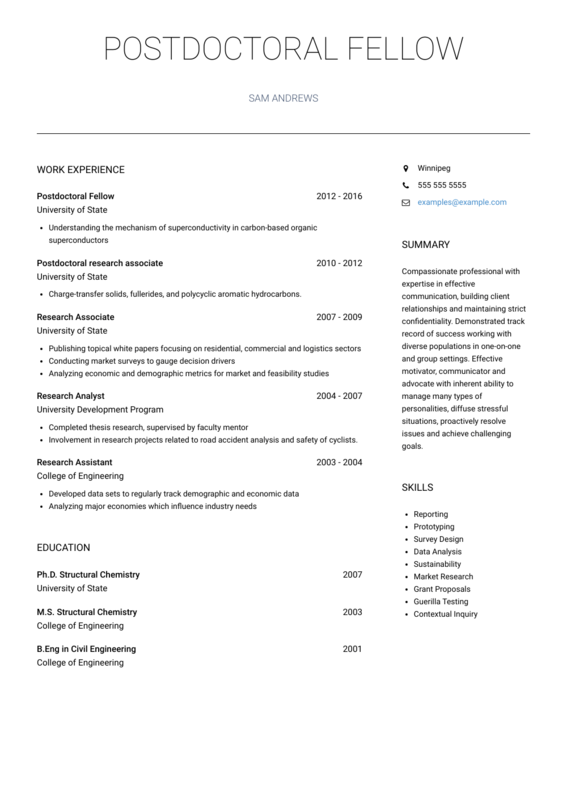 How to Write a Postdoctoral Fellow Resume? You have to show all sides to you as a professional: that means your talents, skills, education and work history. Putting these together to create a resume isn’t as difficult as it sounds and you don’t have to make this an essay that stretches onto ten pages, but rather a one or two page masterpiece. What is fundamental in any academic application process is writing an academic resume that showcases your best wins and lets the recruiter feel and believe that you would be the best asset to any educational institution you’re looking to join. Don’t forget, font styles mean everything to the eye of the recruiter! Therefore, you want to choose a font style that offers a nice look to the resume. Fonts can be anything you like just as long as they can be read. Basic fonts probably are the better options here as they are easy to read and that’s what you want in a sense. Fancy fonts look nice but they can be at times difficult to read and that’s a problem for any employer looking over your resume. Oh, please save your resume as a .pdf as, unfortunately, Microsoft Word is not great at keeping layouts intact. Good summaries will change the way recruiters will look at your resume and, trust us, they will get employers to take notice of you. A short summary is the key here, you do not want to list everything you are going to say later as well: this is your 30-seconds pitch to your future employer, do not waste your opportunity! Use a professional tone to the summary. Add a brief statement about your skills and talents. Talk about what you’ve achieved. Have errors with your spelling. Fill this section up with numbers only. As a postdoctoral fellow you might not have ten or twenty years of work experience behind you but you still have had some work experience during your education and training. You absolutely have to include any and all work experience you might have had as it’s what the recruiters are looking for. Recruiters want to know the type of history you have in terms of what makes you qualified for the position as postdoctoral fellow. You have to ensure your resume has a good array of work experience and with our tips you could hopefully reach the next level. Fit your work experience into your postdoctoral position. Keep your job experienced in reverse-chronological order. Have lots of work experiences listed. Overcrowd information in your work experience. Miss out your top achievements or awards. For more tips on writing the best work experience section for a PostDoctoral fellow like you, check out our detailed resume guide. You are a postdoctoral fellow and your education is the number one element you should talk freely about. This is your strongest area, you have gone through many years of education and this is your comfort zone. Take your time when it comes down to this section of your resume, and make sure you are happy with it before you send it to any recruiter! First of all, we strongly suggest you list all your post-secondary degrees in reverse chronological order. You should start with the most recent one and follow with the one before it, and so on. What is more, if you are in the middle of additional studies, you should list them as well. It’s really a great way to show your eagerness to learn and willingness to improve your knowledge as well. Employers like to see people who take their work seriously. Firstly, when it comes to talking about your skills you really want them to shine through. Remember, recruiters are looking at digital searches to find the candidates which match their criteria. You are going to have to optimize your resumes to ensure the right skills and keywords standout and that you give yourself the best chance to succeed also. You will have to talk about your hard skills along with your soft skills so that recruiters find the best things about you also. We can help you with this part if you aren’t sure about soft or hard skills. Take the time to create a cover letter as it’s extremely important to the recruiter. If you don’t know where to start, we have a few samples you can follow here. Forget to add your cover letter. Opt for three different fonts. Use more than one font size. Not only we provide the best video producer resume sample in the market, we have also worked on fantastic video producer resume templates. You should check this masterpiece we have been working on here : many professionals like you have successfully used it to take their career to the next level.